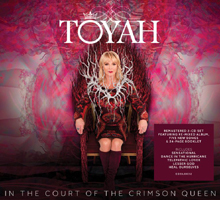 Listen to this important message from Toyah and then head over to Super Deluxe Edition to read about all about the new 2CD deluxe edition of In the Court of the Crimson Queen. Signed copies available! Exclusively on vinyl next month comes eighties alternative. This offers 30 ‘alternative’ eighties songs from a variety of artists including Scritti Politti, Pixies, Propaganda, Bauhaus and John Foxx. As is often the case with these kind of compilations the definition of ‘alternative’ is rather broad, so as well as the artists above, tracks from Howard Jones, Bronski Beat and Dead Or Alive also feature. No CD release for this 2LP set, which is clearly designed to appeal to those who have re-embraced vinyl, and it’s pretty good value at under £17 in the UK. 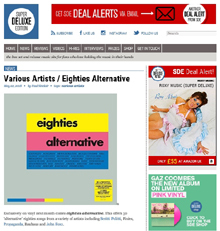 eighties alternative is released on 1 June 2018 on Demon Records. • Continue reading at Super Deluxe Edition. More info on this here. (NB: I Want To Be Free by Toyah is included on LP2 of this double vinyl album).